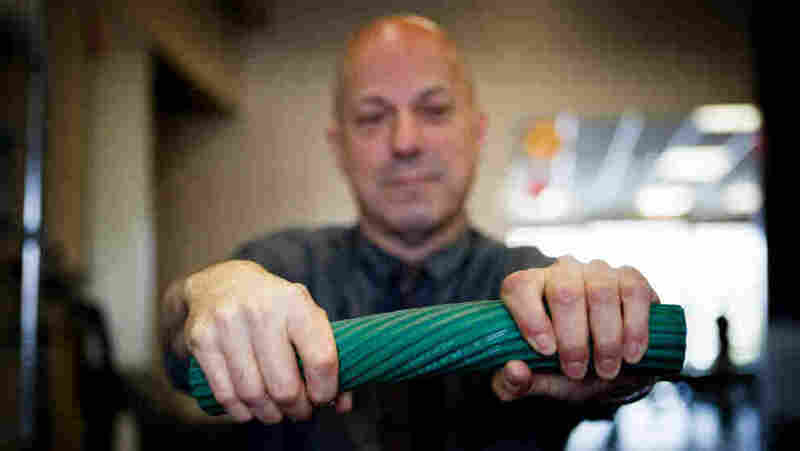 A Rubber Twist On Treating Tennis Elbow Pain : Shots - Health News Some people are finding relief from tennis elbow, a condition caused by many activities besides tennis, by trading traditional hand weights for a rubber bar to strengthen their injured muscles. Larry Holzman does a series of eccentric wrist exercises using a rubber bar called the Thera-Band FlexBar. Larry Holzman — avid mountain-biker, skier and guitarist in a band — plays hard. And he didn't want to give it all up due to a "spot of pain" in his elbow. "This wasn't a traumatic injury," explains Holzman. It came on gradually and escalated from annoying to excruciating over the course of a couple months. His physical therapist quickly diagnosed it as tennis elbow. Turns out, lots of people who develop tennis elbow haven't played the game in years. And some have never even picked up a racket. "If you're having pain on the elbow on the outside of your elbow when you grip a coffee mug or pick something up with your hands — that is almost always tennis elbow," says Barton Bishop, a physical therapist at Sport & Spine Rehab in Rockville, Md. Pain from repetitive overuse of the tendons and muscle that run from the wrist to the elbow can come from all sorts of activities. It usually happens when people grip things too hard or too long. Holzman's injured left elbow muscle strengthens as it lengthens and contracts in this eccentric wrist exercise. In addition to tennis players, Bishop sees the injury in gardeners with their shovels and trowels; painters with brushes; and golfers with clubs. In Larry's case, it was a combination of all his hobbies: from squeezing the handlebars on his bike, to lifting weights and playing in a band. "Gripping guitars and base drums ... can really affect people's elbows," says Bishop. When Holzman came to Sport & Spine for help, Bishop put him through a series of traditional treatments including ultrasound, strengthening and stretching exercises, cross-friction massage, heat and ice. He also added a series of eccentric wrist exercises using a rubber bar called the Thera-Band FlexBar — ideal for the injured muscle in tennis elbow. The exercises enable the muscle to lengthen and contract simultaneously. And the FlexBar makes it simple to do this kind of stretch. "He's actually getting his muscle to work," says Bishop. "It's a perfect exercise." Bishop says the benefit of the FlexBar, which costs between $16 and $33, over traditional hand weights is that it helps people strengthen without recreating the symptoms. He says weights can overwork the muscle and sometimes leads to more pain. Not all physical therapists are sold on the FlexBar. "There's a variety of methods you can use to achieve the strengthening technique," says Jason Grandeo, a physical therapist at Body Dynamics, Inc. in Arlington, Va. But he understands the appeal: The FlexBar is easy to use and you can do it at home.